Vintage never goes out of style. When you browse the many antique stores and consignment boutiques around Hampton Roads, you’re sure to find a wealth of fashionable dresses and suits, vinyl records, and other gadgets from bygone eras. We know vintage clothing is a popular option for proms, weddings, and other social events, and if you’re into reliving the past through your wardrobe you should know that older clothes require a different level of care than your everyday attire. Storage, too. Rent a climate-controlled unit. Temperature plays a big factor in preserving old vintage clothing. In a storage unit, you can keep the climate consistent unlike at home, which means your older outfits are safe. Be careful with moth balls. Moth balls are important in storing clothes, as they help eliminate insects that would otherwise eat through the fabric. However, they shouldn’t directly touch your vintage threads. Wrap items in muslin and place the moth balls on top for added protection. Unbleached muslin fabric is preferred for vintage storage, since cardboard and paper contain acids that could damage the clothing. Be careful what you hang. You may think it’s easier to hang your outfits on a rack. This could actually harm the clothing. 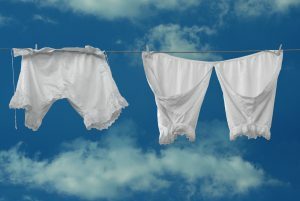 Older fabrics made with natural fibers differ from synthetics – they can expand and “breathe” and may stretch out if left on a hanger for a long period of time. Depending on the outfit, it is better to store flat or folded. If you have questions about storing old items – everything from hats to bureaus and antique cars – contact us today at 757-413-9050. We’re ready to help you with your Chesapeake self-storage solutions.